The History of Religions School of the 19th/20th century was VERY important for the development of historical critical studies. Lüdemann hopes that the piece will raise awareness among students of this highly influential school of thought. I am happy that he wrote this piece because I have been concerned for several years about the obsession with post-modern trends that, in my opinion, are ravishing the academy and its ability to function in the next generation of scholars in terms of philology, linguistics, and historical hermeneutics. What are your concerns specifically? I have some issues generally speaking but would like to hear what you have to say about post-modernism and the study of the Bible. My biggest concern is that the downfall of biblical studies as we know them is going to be a financial one. My biggest concern grows out of some post modern literary interpretation models that suggest that interpretation of the literature belongs to each person who does the interpretation. That is that one cannot criticize another's "truth." Seriously, if one says that another's interpretation is wrong the one doing the criticism is called an oppressor. I don't know if this is what Dr. DeConnick refers to but it is one of my concerns. 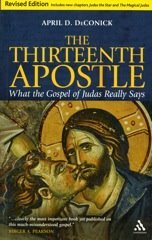 My concern is that the high bar of which Biblical studies and Classics more generally are justly proud of-- the high bar of languages, history, anthropology, the high bar required to even begin to understand ancient literary documents-- will be sacrificed to the absurd idea that every goofball's ideas are as good as every other's. As a CONSUMER rather than a PRODUCER of scholarship, I want the standards kept high. If I want to read dopey litcrit I can always go over to the English Dept.